It’s that time of year again, and I’ve got you covered! I’ve always found filling stockings so much fun! When my guy was in preschool it was especially fun – because the stuff is so darn cute! So here you have it – the only preschool stocking stuffer gift guide you’ll ever need (it’s unisex)! 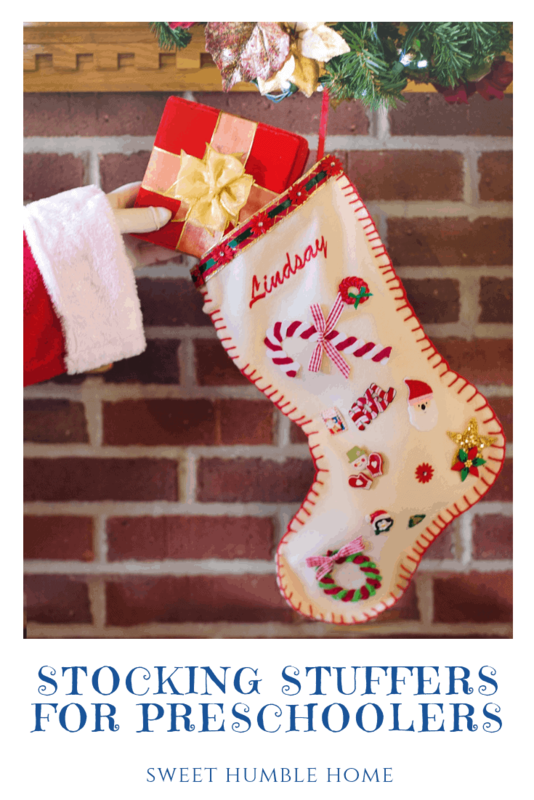 Gift Guide – Preschool Stocking Stuffers! This first one will take you back! What little kid doesn’t love a slinky?? Original Slinky! This matching game for pre-school aged kids is a perfect stocking filler! I remember picking one up for my little guy! Have you ever tried these?? I love them! Has your child ever played with Wikki Stix? They’re a malleable, bendable, crafting toy! They even help with fine motor skills! BONUS1 My friend first introduced us to these when our guy was in pre-school and we love them! Who doesn’t love a little art in the tub?? Crayola Bathtub Crayons are an awesome stocking stuffer for a little one! Let their creativity run wild! Every kid loves a game of Go Fish! I remember playing this with my mom and dad and having so much fun! Perfect for a stocking stuffer! I started collecting ornaments indicated by year the year our son was born. When he’s grown and ready to have his own tree he’ll already have a collection all his own! I’ve always thought this was so cute! The Kangaroo Do You Want To Build A Snowman. Best part – there’s three in a pack if you have more than one child! Your child can build a snowman and then let it dry to keep him, or put the putty back into the container to build again! A book is ALWAYS a good idea! I have always rolled up a book and put it in his stocking each year. I plan on handing these over when someday I have a grandchild on their first Christmas (remember to sign the inside with a note and the year)! These Schylling Mini Magnetic Sketch and Erase boards are perfect to keep in the car! The little pen is attached so they’ll never lose it! The options really are endless! I hope you find this guide helpful! If you need ideas for teachers or grandparents hop on over to my gift guide tab and see what you can find! If you know of some other perfect preschool aged stocking stuffers let me know!